The breed has many different qualities that make up its overall temperament. It is playful, fun, exuberant, inquisitive, attentive, devoted, and demonstrative. It is also very loving and loyal to its family and owners. It’s a great choice for an active family, as it has tons of energy and makes a great, playful companion. It should also be noted that the Boxer can be stubborn at times. But usually, it is responsive to commands and is sensitive. If a strange dog approaches it, it can be reserved and become aggressive. But if it is familiar with another household dog or other pets, it does well. This breed requires mental and physical exercise on an everyday basis. Jogging and hiking are two great ways to meet these needs. They let the dog explore while still getting physical exercise. Long walks are also highly recommended forms of exercise. Regardless of what you choose, it is important that the dog be exercised. It is not typically suited to survive outside and does the best when it is indoors. This breed is also known to snore on occasion and shouldn’t alarm the family if they notice this occurs; its fairly normal. Its coat is so short that the only main reason for maintenance is to remove dead hair and skin cells. The Boxer is susceptible to a few major health concerns including boxer cardiomyopathy, SAS, and CHD, which stands for Chronic Hip Dysplasia. Minor concerns are also seen in the breed and include gastric torsion, hypothyroidism, corneal erosion, and colitis. Brain tumors and degenerative myelopathy are occasionally seen and should be treated if noticed. It is recommended to take your Boxer to the vet for yearly checkups so they can get tested for different things. If kept healthy they can live up to 10 years old. 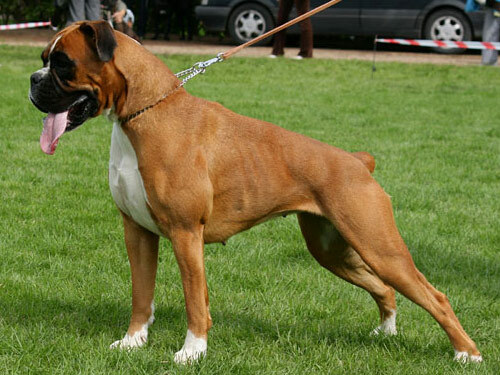 The Boxer is the product of two European dogs that no longer exist. The first breed is the Danziger Bullenbeiser and the second is the smaller Bullenbeiser. They were initially used to chase large game, such as deer, bears, wild boars, etc, through forests and different types of terrain. Once the game was captured, they would hold onto it and wait for the hunter to arrive to kill it. The dogs had to be very strong and agile in order to perform this task and they had an extremely powerful jaw. Its nose was pushed back into its face, allowing it to breathe with its mouth closed in on the animal. These characteristics were required in bull-baiting which was a very popular sport in Europe. In England, the Bulldog was the preferred breed used to play this sport, due to its physical characteristics. Mastiffs were used for this sport in other countries. Around the 1830s, the Bullenbeiser was mated with the Mastiff to create the Boxer. The result was the agile, strong dog that is known as the Boxer today. The coining of the name Boxer is unknown but its said to be derived from the German word Boxl. Today, it is ranked 7 in the AKC.